One in four workers in today’s enterprises are already cloud workers, reports Forrester. They want flexibility and mobility; to get work done on any device, anytime, from any place. So how do we prepare for this environment? A group of business technology leaders gathered in Perth to discuss how to meet the demands of this tech savvy group. One in four CIOs will expand their remit in 2019 and become true owners of digital business and technology-led innovation, leaving the rest relegated to trusted IT operators. 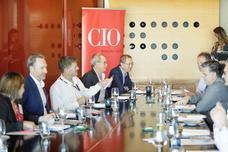 CIOs need to stop trying to force CMOs to purchase technology through the IT department and focus on offering skills in purchasing and vendor management that marketers don't have, says Tourism Australia's CIO, Dave Rumsey. The battle for mobile social supremacy is largely a two-horse race these days as Facebook and Google combine to claim one of every four minutes U.S. users spend on mobile devices, according to a report released this week by Forrester Research. Forrester tracked the app use of 1,721 adult smartphone users in the U.S. during the three-month period ending in December 2014. When Home Depot and Target experienced large-scale security breaches on payment systems in 2014, it hit those top retailers hard: Criminals stole millions of consumers' debit and credit card data; the companies lost hundreds of millions of dollars in fines and lost sales; and their brand reputations suffered. What began as an experiment in consumer electronics in the early 1990s celebrates its 20th anniversary as a staple of enterprise computing this week. Java has become a dominant platform, able to run wherever the Java Virtual Machine is supported, forging ahead despite the rise of rival languages and recent tribulations with security. CIOs who want to create beloved mobile apps will need to do things that are highly unusual in IT: Go on sales calls, ride along in the service trucks and watch consumers talk in focus groups about what they hate about your business. How do you ensure you are choosing the right threat intelligence solution for your organization? The recent Forrester Research, Inc. report, “Use Actionable Threat Intelligence to Protect Your Digital Business,” describes the characteristics of effective threat intelligence and what to look for in a threat intelligence vendor (August 2014).